On occasion, we luck into a case of garlic at fire sale prices at a fruit stand. If the cloves are full and healthy, we buy it and run. However, there is no reasonable way to use an entire case of garlic in regular cooking without losing some to spoilage. We opt to freeze a good bit of it. 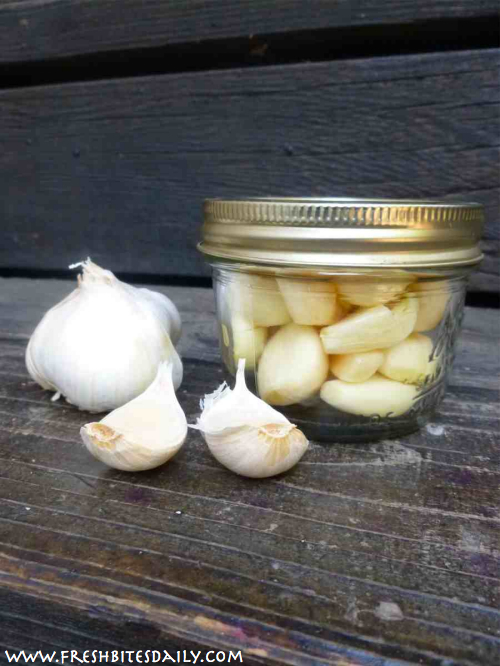 Freezing garlic is simple: We peel the cloves and freeze them whole in a canning jar. You may be tempted to freeze the cloves in plastic freezer bags, but protect the rest of your freezer stash and keep these pungent items enclosed in glass instead. There is no trick to freezing garlic. The key time-saving technique is in peeling an entire case of garlic. Even if you are good with a knife, use the technique in the video below to “bang” the garlic skin, loosening it up before peeling it. Use your frozen garlic as you would fresh garlic. It is actually fairly easy to chop frozen so you do not need to plan for defrosting time. The quality of garlic after it is frozen is not quite as good as it is fresh, but we find it to be better than the jars of garlic cloves you can buy that are already peeled. As a result, freezing garlic is a good solution for preserving a case quantity and will be a great convenience to pull from your freezer and add to recipes. 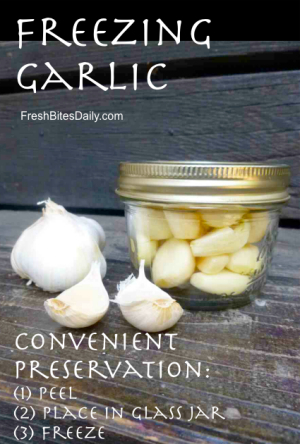 5 Comments on "Freezing Garlic: Preserve the flavor and keep it from stinking up your freezer!" Thanks Amanda! Preparing garlic for sauteing purposes eats up a good amount of time so I highly value this great suggestion. I usually leave my cloves of garlic inside a basket and they do rot after a couple of days so I end up with so much wastage. I haven’t heard that Adrienne. It probably reduces it, but I’ll look it up when I have a chance. Garlic is powerful as anti fungal, anti bacterial anda natural antiseptic. The spice also widely available in traditional market with affordable price. Do you know if you can infuse coconut oil with garlic as can be done with olive oil? or any other herbs? I’ve read somewhere to be careful of botulism, was that just for garlic infused oils? I can’t find anything online regarding this question, thought I’d ask cuz I know you love coconut oil too. My thought is to infuse expellier pressed coconut oil which has no flavor compared to those coconut oils that do taste like coconut.